Rabbi Keith Stern will patch in his children in Africa and California for the family’s seder. At his family’s Passover celebration Monday, Rabbi Keith Stern of Newton’s Temple Beth Avodah will gather relatives around the table for the Seder meal commemorating the exodus of enslaved Jews from Egypt thousands of years ago. Stern plans to place computer screens on the Seder table and include his traveling children via Web video connection. So why is this Skype different from all other Skypes? “We were thinking our kids are very loyal about being around for family celebrations,” Stern explains. Because they’re accustomed to staying connected for the holidays, he says, it seems natural to have his children participate in the readings and discussions remotely. Integrating modern technology into this family-oriented ritual — one that bows reverently to the past while celebrating the vitality of Jewish life today — is a relatively new phenomenon and not without its skeptics. But it’s one trapping of modern life that’s becoming more of a resource for nuclear families as they grow older and split apart, according to many in the Jewish community. 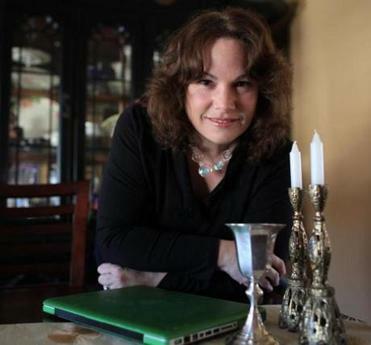 Linda Freeman Goodspeed will be using a laptop to include family members from western United States during Passover Seder at her home in Beverly. Linda Freeman Goodspeed will also be placing screens on her Seder table this year and firing up the WiFi. Goodspeed’s niece recently moved to Las Vegas, and one of Goodspeed’s brothers lives in Los Angeles. A live-time video connection will allow them to be together for at least an hour or two, says Goodspeed, who lives in Beverly. Family members and guests will also use a smartphone app to guide them through the shared reading of the Haggadah, an ancient text retelling the exodus story and explaining Passover’s feast of symbolic foods and wine. Goodspeed has also posted a note on her Facebook page inviting friends to join the Seder via Skype. “We’re very welcoming,” she says. Some Jewish individuals and congregations are taking participation even further into the cyber realm. OurJewishCommunity.org, an online synagogue affiliated with Congregation Beth Adam in Cincinnati, offers video-streamed Rosh Hashana and Yom Kippur services. Its online Seder on the second night of Passover is also open to all. Last year, according to co-director Rabbi Robert Barr, hundreds of people joined from around the globe. 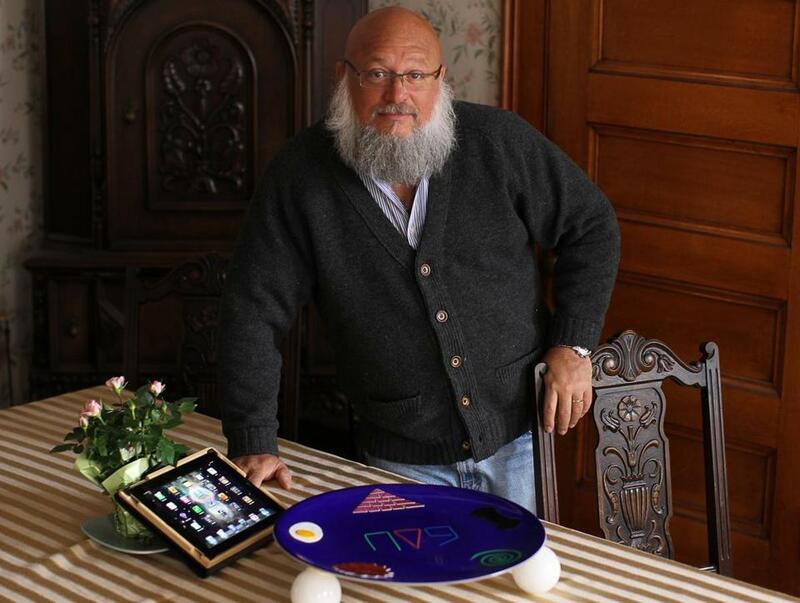 Bringing Skype and app technology to the Seder table is not for everyone. Orthodox Jews are forbidden from using any electronics on the Sabbath or on Jewish holidays. Even among Reform Jews, says Stern, rabbinical opinion is divided over what digital resources are appropriate to use — and when. If anything surprises Shirat Hayam’s Rabbi Baruch HaLevi, it’s how few congregants have mentioned Skyping at their family Seders. No matter how liberal, he says, many Jews regard such practices “almost like mixing milk and meat,” which is prohibited under kosher dietary laws. In Marblehead, Rabbi David Meyer of Temple Emanu-El, a Reform congregation, says that because the Seder is not a synagogue-based service or ritual, but a family one, it has become “a very strong candidate” for using a tool like Skype to connect with far-flung relatives. Still, he predicts more families will use the technologies once they feel comfortable. In one recent case of technology overcoming geography, a father who was stranded overseas by an airline shutdown faced missing his daughter’s bat mitzvah ceremony at Emanu-El. A laptop was placed on the bima, the central podium in the synagogue sanctuary. Using WiFi and Skype, the father was able to be present for the Torah reading and parental blessing. Jonathan Sarna, professor of American Jewish history at Brandeis University, agrees with Meyer that virtual is not the same as actual. Yet Sarna, too, sees advantages to living — and celebrating — in the new digital world when other options are closed. At his home in Lexington last year, Jonathan Goldberg placed a large video monitor at one end of the Seder table so he could connect with his sister’s family in Denver. Three generations of Goldbergs and their guests proceeded to share in the Seder ritual by Skype. As the Haggadah was passed around, readings were handed off seamlessly from one group to the other, two time zones apart. Goldberg works for a company that develops web-camera chips, so Skyping in this manner did not seem unusual. Unfortunately, his sister’s table had only a smallish laptop screen, making it hard for them to see the Lexington crowd. “A bigger monitor would have been better,” says Goldberg.